I’m a bit fascinated and baffled by the disconnect between desire and action. We all seem to be clamoring for a better world, better life, better health, better relationships, better everything, but so few are willing to do the work. To not only endure, but invite the effort needed to fuel change. So, a few years ago, I wrote about it in a short piece called Everyone Wants Better, No One Wants Change. That post went viral. And ever since, I’ve wanted to craft a more visual expression of the content. So, we’ve edited it into a short 100-second visual essay. I hope you enjoy it. 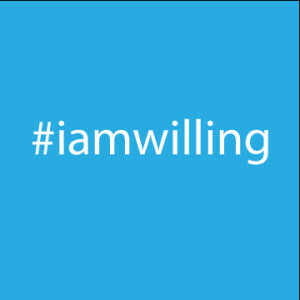 And if you do, I’d be grateful if you would you consider sharing it with the hashtag #iamwilling. ……….should I write some more? I am! Thanks for speaking the words the world needs to hear! Amazing. And so true. Change is uncomfortable. Inevitable changes are bad enough, but making them happen *on purpose*–that’s bravery. That’s being willing to stand in the fire. Thanks for the this–the original essay, the new video, and the inspiration. We all want… but hesitate taking responsibility for the actions that will bring it. Owning the change is owning the impact. That’s tough in a entitled society. Owning the change only happens when the pain is too great to endure or the love and courage strong enough to break through the barriers. My new morning question to myself is: What edge of fear can I step through today that will bring the change I want? You captured this issue so eloquently – and the video is amazing! This is a much needed message and I shared it everywhere! Thank you!! Yes! We all want to enjoy the glory but no of us want to endure the pain. Well captured Jonathan. I’m not sure that Maslow missed this point. Humans are wired to be resist change. This is known as homeostasis, and it’s included in the base level of the hierarchy of needs for survival. Not that I think this takes away from your message. But at a basic level, humans need that, and when we move up the hierarchy, having other of our needs met, I think we become enable to withstand and even embrace change, and to work with others to effect change. I liken it to the safety instructions that a stewardess on a flight advises you off: In the event that the oxygen masks deploy, apply the oxygen mask to yourself first so that you can then be able to assist others. If you’re in survival mode yourself, you need to get yourself stabilized before you can move up in Maslow’s hierarchy, and be of greater use to society. I agree with you Mark. I’ve read that it is a basic human need for security. If we are in survival mode it is difficult to move beyond until we feel “safe.” Also I think people think that change has to be massive or a huge undertaking to be effective. I’ve made some small changes over the past several months. It added up to me losing over 10 pounds in 6 weeks and my husband losing over 20. No, we did not starve ourselves! We cut down on the fat in our diet. That is just one example. We need to educate ourselves and having support really helps. We always want both (we’re wired that way), but usually we can’t have both (MORE implies more stress or effort or suffering, even if temporarily), so most people choose the path of less resistance, i.e. the LESS suffering. And that’s why we resist change. I’ve noticed that the resistance to change seems to grow stronger as we age, and there are a LOT of aging people now, in increasing numbers for the next few years. So, as that segment of the population grows, the one that fostered so much change back in the 60s and 70s, it has become necessary for others to pick up the banner for change that boomers set aside. Thanks for leading the pack, Jonathan! Mia, I’ve found that as I’ve gotten older, and as I’ve manage to survive some traumatic blows to my life here and there, I’ve gotten to be less fearful, and to think that change ain’t all that scary like it’s cracked up to be. Maybe you’re right about people who’ve lived comfortably for so long that they can’t imagine anything different are more likely to just be content staying the same. But there are some people who’ve lost almost everything and had to rebuild, and during that rebuilding, they realize that they hadn’t really lost everything. They just lost something, and they learned to either live without it, or get it back. Friends are still there. Family is still there. They abilities are still there. These realizations make change something to be a lot less afraid of, and it often comes only with age and experience. Own it, and be willing to die for it. It will then be yours. I have learned that I am when I am invested in the outcome change will precipitate. The discomfort and pain of change has to be a life and death kinda buy in for me. If I am not committed to the thing being changed – why bother with all the pain? I must be sold on the outcome and I am terrifically skeptical. Once sold – I have to constantly remind myself that I want this change. When I don’t the comfort of the known will become my hiding place; my friend when change overwhelms and bruises – and change quickly becomes the enemy. Own the process. Powerful. I think it’s what everyone’s “style” is determined as. We are judged by the results, but it’s the process that is our USP and what gets us there. Thanks for the reminder Jonathan. Great post. Sometimes I find that people want to FORCE change for no reason at all. Some want to make a change when they do not even need to, with the effects being just as devastating as those realized when not acting on a desire. Yep. Your truth is our truth. F’ing fabulous. Thanks.